Viking Sun has a thoughtful array of dining options, day and night. There are seven venues to choose from, ranging from ultra-casual to gourmet, and in-cabin room service is available around the clock. Menus offer a terrific variety of options, and one recent improvement on Viking Sun was quite a good selection of healthful dishes, from starters to desserts. Dishes that are sugar-free, vegetarian or heart-healthy are marked on the menu. As well, the ship's culinary team is happy to work with passengers with special dietary needs (though we do encourage you to make arrangements ahead of time). Complimentary house wine, beer and soft drinks are poured at lunch and dinner at all venues. Reservations are highly recommended. Because these menus are set, if you have very specific dietary restrictions you'll need to give advance notice to the maitre d' so he can accommodate you. Why so popular? It's the food, of course; the cuisine emphasizes rustic interpretations of classic Italian favorites, like chicken parmigiana, pasta e fagioli and bistecca Fiorentina, along with homemade pastas, soups, starters and desserts. The antipasto, created in a deli-style open kitchen, is worth a visit alone. If you've dined at Manfredi's on other Viking ships you'll be interested to know that a slightly tweaked menu has debuted on Viking Sun (though all the classic favorites, aside from its Nutella panna cotta) are available. The Manfredi's menu is divided into six categories (not including side dishes): hot appetizers, cold appetizers, soup, pasta, main dishes and dessert. Qualcosina ("a little something") features the hot and cold appetizers, such as beef carpaccio, caprese salad, fritto misto and baked goat cheese. Zuppe, the soup course, includes chilled cucumber, a classic pasta e fagioli and cream of pumpkin. The pasta course, with eight delicious options plus a daily special, could cause serious belt-loosening; there's risotto, ravioli, tortellini, lasagna and gnocchi. Some are vegetarian, others are seafood- or meat-based. You can ask for an appetizer-sized portion if you just want to sample a few bites. At Manfredi's, there are five mains, plus a special, that are a blend of homespun and gourmet. Chicken parmigiana, veal scallopini, duck breast, the bistecca and grilled swordfish are the standouts. Try to save room for dessert, where tiramisu and a fruity panna cotta are particularly popular. The ambience is also superb, with its black-and-white photos of famous Italians decorating the walls, cozy booths and plenty of tables by the windows. Tables accommodate two, four, six and larger groups, and the restaurant has a private dining room seating a dozen. It's open to anyone and there's no fee, but it's by reservation-only. Viking Bar (Deck 1): A great spot for a quick pick-me-up on your way out to port, the Viking Bar offers a small array of breakfast sandwiches and pastries in the morning, followed by sandwiches and cookies until 6 p.m. The Kitchen Table (Deck 1); $180 to $260 per person: A shore excursion blended with a culinary workshop, The Kitchen Table, offered on most cruises, is a unique experience. Limited to a maximum of 12 people, the event starts with a guided market tour hosted by one of the ship's chefs. The chef essentially chooses produce and other foods with an eye to what's fresh and local -- and what will make an incredible dinner that evening. The group reassembles at 6 p.m., where a huge marble table is set for dinner, with various hands-on cooking stations scattered around the room. You can participate in the preparation or just watch; because the group is so intimate, you can sidle right up front to the chef's station. Ultimately, meals prepared are both magnificent and munificent. You can expect a four-course meal, along with massive antipasti. It's a good idea to eat a light lunch on the day you're dining at The Kitchen Table. Wines are matched to the menu and also reflect regional variations. 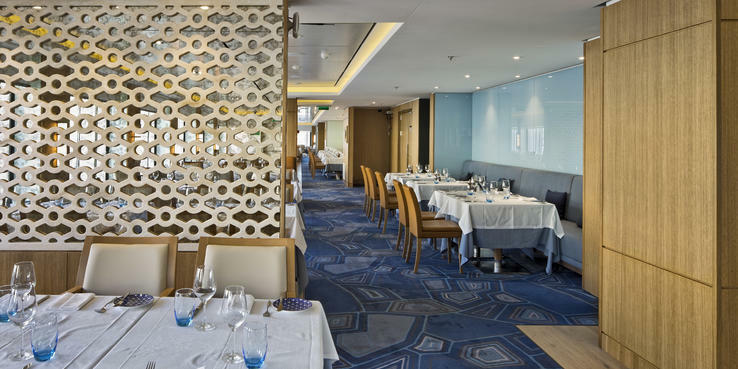 The Restaurant (Deck 2): The main dining venue onboard Viking Sun, The Restaurant offers breakfast and dinner daily, and is open for lunch on sea days. It's one of the most improved venues on any of Viking's ocean ships, with serious attention paid to a balance of healthy and tasty cuisine. We love the daily three-course option, available at lunch and dinner, which focuses on the cuisine of the region you're sailing in. Of all the ships, the ambience in The Restaurant on Viking Sun is particularly beautiful; that's due to the inviting Nordic-influenced art collection that graces its walls. Tables for two are plentiful, and we love that they can easily be pushed together to accommodate groups of four or more. One note, though: They are situated rather close together, and you might find that even at a table for two, you'll be in easy conversation with the folks next to you. All dining is open-seating. There are no reservations. At breakfast, the menu offers a wide range of dishes. Breads, from Danish to croissant, are plentiful. Cold dishes include fruit, cereal, yogurt, cold cuts and (thanks to the line's Nordic heritage) smoked salmon and Swedish shrimp salad. Hot items feature pancakes, waffles and oatmeal. Fish options include steamed haddock and broiled kippers. Egg selections include omelets, Benedict (with ham, creole-style or salmon) and "any style." Grill offerings include minute steak and baby lamb chops. If you want to keep things simple, each menu has a handful of set offerings. The American Breakfast comes with two eggs, bacon or sausage, sauteed potatoes, juice and coffee. The Continental is an assortment of pastries, along with cereal or granola, and fruit and yogurt. Fruit is served on its own, too, both in fresh and stewed varieties. In The Restaurant, lunch is offered primarily on sea days. It's a lovely, though somewhat limited, three-course menu. Appetizers include soups and salads and a pasta dish that can also serve as an entree. A pair of sandwiches and a daily-changing burger are offered, as are "main course" salads. Hot entrees vary daily, and there are also desserts, which include ice cream and one sugar-free option. For each course, there's one regional selection that changes daily. In the evening, The Restaurant is convivial and lively. Looking for an aperitif before dinner? The little-used bar in the center of the Restaurant is a wonderful place for a drink. Viking Sun's three-course Regional Specialties tasting menu is inspired by the itinerary and features local dishes and changes daily. (It's also different at lunch and dinner.) A cruise with Spanish calls could, for instance, include a first course of gazpacho, followed by albondigas (beef and pork meatballs) with fried potatoes, and a mousse de turron (made with nougat) for dessert. Otherwise, there's a full array of starters; entrees that include meat, fish and vegetarian options and a nice selection of salads and soups. The "always available" dinner menu includes prawns, a classic Caesar (with chicken or shrimp), strip steak, poached salmon and roast chicken. At dessert, multiple flavors of ice cream are always offered (they change daily), along with several sweets (cheesecake, souffle, creme brulee, pie, panna cotta), a fresh fruit plate and a cheese course. Wine, beer and sodas are poured on a complimentary basis at lunch and at dinner. Red, white and, occasionally, rose wines are free-flowing; the daily choices are picked by the sommelier. If you don't care for the options presented, you can ask if there are other varietals available. As well, there's also an option to order other wines, both by the glass and bottle, for an additional price. World Cafe (Deck 7): The World Cafe is the ship's sprawling casual restaurant that's part buffet and part open kitchen. In a hurry? Take advantage of the items in the buffet, which are never kept out too long. Chefs will also prepare a la minute versions of dishes upon request. The World Cafe is a bright and airy space, lined on three sides by floor-to-ceiling windows that can open in good weather. Breakfast, lunch and dinner are served here daily. Here, too, there are plenty of tables for two and four, along with larger tables for groups. The World Cafe, long and lean, has two separate sides; stations are by and large identical. At the aft end is the Aquavit Terrace, with a bar that serves both the dining room and the outdoor tables. At breakfast, made-to-order (or at-the-buffet) eggs, pancakes and waffles are available. Oatmeal is a staple, as is a bountiful array of cold cuts, cheeses, pickled fish and Norwegian salmon. Cereals, pastries, English muffins and bagels are all available. There's a smoothie bar by the Aquavit Terrace. At lunch, there's a small salad bar, which includes greens and fixings along with pre-prepared potato, macaroni and vegetable salads. These vary daily. A daily pasta choice is made to order and we found all we tried to be superb. Each day features a carving station with hot sides, a sandwich station, a pizzeria and a dessert bar. Don't miss the gelato station; it's the one spot in the World Cafe that always has a line. Different flavors are made fresh each day. Wine and beer, along with sodas, are complimentary in this venue as well, and are served by the ship's wait staff. Dinner at the World Cafe is a superb event. The ambience may be casual (with the Aquavit Terrace open for alfresco dining, if weather permits) but the food is beautifully prepared. The big star is the nightly array of crustaceans and fresh sushi. Otherwise, the offerings hew closely to what's served in The Restaurant; it's just a more casual ambience. There are options for meat and fish lovers, as well as vegetarians. The ice cream bar is open, and desserts are plentiful. The Pool Grill (Deck 7): The restaurant, typically open only for lunch, is the only spot onboard to serve well into the afternoon. It's got a huge variety of burgers; the Pastrami King's burger and the Pancho Villa burger (blue cheese and guacamole) are among the more exotic, but there are plenty of standard varieties, too. We love the shrimp salad sandwich with dill, the classic Reuben and the chili dog. Also worth checking out are the Texas chicken wings and marinated mahi-mahi. Freshly cooked fries are sinfully decadent. And, yet there's good news for healthy diners; there's a daily array of fresh fruits and vegetable salads that are delicious. One distinction aboard Viking Sun is that, during the world cruise only, the Pool Grill is open in the evenings as a casual noodle bar. The Pool Grill has a handful of high tables (and there's another handful across the aisle, near the bar), and there are lower tables scattered around the pool for dining. Mamsen's (Deck 7): In honor of the mother of Viking founder Torstein Hagen, Mamsen's features sweets and savories from family recipes. It's tucked away in the Explorer's Lounge and can be hard to find unless you are looking for it. It's worth the effort. Open for breakfast, lunch and post-dinner snacks, Mamsen's dishes up Norwegian comfort food, such as waffles with any manner of toppings (from chocolate to cheese), pea soup, Norwegian smoked salmon and lush Nordic-style cakes. Much of its classic offerings are available throughout the day. Breakfast also features pastries and pickled herring. At lunch, you can get sandwiches. Wintergarden Conservatory (Deck 7): Traditional afternoon tea, held every day in the Wintergarden, is one of the more elegant at sea. It's hugely popular; plan to arrive early to snag a table. Tea is, of course, served (as is Champagne, wine and other spirits for an extra fee). The star of the show are the snacks -- scones with clotted cream and sandwiches with crusts cut off. Room Service: Room service, offered around-the-clock, has two distinctive menus. At breakfast, the menu is generous and broad, with items ranging from cold dishes to hot ones. There's a smoothie of the day. You can place an order before going to bed by filling out a card and hanging it on your door. Beyond breakfast, we love the comfort food-inspired menu. Options include Norwegian gravlax, Jalapeno cheddar cheese fries, New York strip, spaghetti bolognese, and burgers and hot dogs. Caesar salad, with chicken or shrimp added, is also available. Desserts include chocolate mousse, a cheese plate and an assortment of fruits. During lunch and dinner, you can include wine, beer and soda in your order at no additional charge.